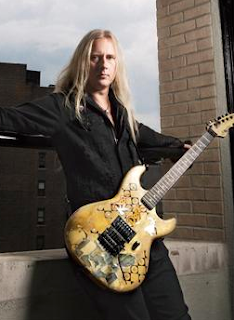 Jerry Cantrell of Alice In Chains fell in love with the G&L Rampage early in his career. Though some Rampage guitars were built with bodies of ash or poplar, “my Rampage is an all-maple guitar,” Cantrell says. “The neck is hard rock maple, and the body is maple, too. Also, it has one pickup with one volume knob. I’ve never had the need for a lot of knobs or switches, so the design has suited my needs perfectly. Cantrell’s primary Rampage is tuned to what he calls “standard Alice in Chains tuning”: standard tuning one half step down (Eb Ab Db Gb Bb Eb).